Did you hear a Giant duck is coming to Toronto this summer! The six-storey-tall, 13,600-kilogram yellow duck is being brought to Toronto by the Redpath Waterfront Festival, at a total cost of $200,000, combining other funding such as corporate sponsorship. An Ontario government grant of about $120,000 that is going toward a giant rubber duck for Canada 150 celebrations is ruffling some feathers. It’s being billed as a tourist attraction – with particular Instagram and selfie appeal – and will also be taken to other communities in Ontario. 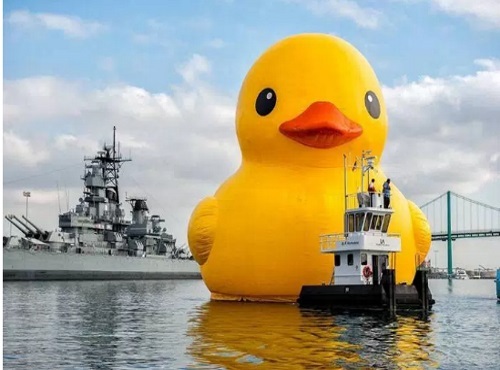 Ontario’s Progressive Conservatives say they’re unclear on the giant duck’s connection to Canada’s heritage celebrations. “It’s an absurd waste of taxpayers’ dollars,” Rick Nicholls said in question period. What do you think? cute or huge waste of money? Have your say on our Facebook Page post here. Click here for the news story on Global News.